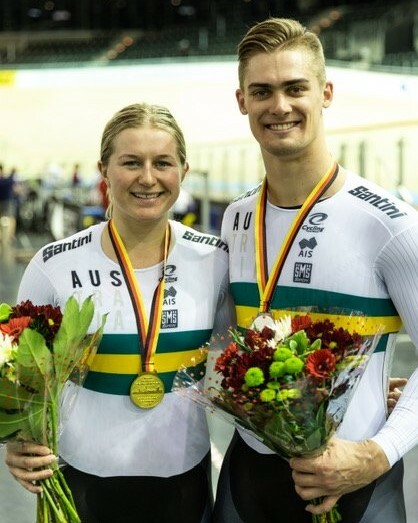 CYCLING: The Australian Cycling Team grabbed four gold and two silver medals at the third round of the UCI Track World Cup in Berlin, Germany this weekend. World record holders Samuel Welsford, Alexander Porter, Leigh Howard and Kelland O'Brien, plus Cameron Scott claimed team pursuit gold while reigning world champion Matthew Glaetzer continued his unbeaten run in the sprint. Stephanie Morton claimed her first individual gold of the season and Sam Welsford added omnium gold to his tally. Th event continues the team’s strong start to the six-event World Cup series which began in October, with Australia topping the medal tally in Paris claiming three gold, three silver and two bronze medals, before adding four medals, including two gold at round two in Canada. "This World Cup was another good benchmark for the Australian Cycling Team and shows we are progressing well and currently on track," said Simon Jones, Performance Director, Cycling Australia. "There is still a lot of work to do, but it’s good to score UCI points and be competing well." In Berlin, the quartet topped qualifying (3:53.426), and with Cameron Scott coming into the team for the first round, progressed to the final with a strong win (3:53.033) over rivals and Olympic champions Great Britain. “It was great to line up again with the boys,” said Welsford. “Today was one of the hardest sprint competitions I have done,” said Glaetzer, who revealed he is in the middle of a training block. The Omnium Nationals cap the week on Friday 14 December, with Melbourne Arena to host a massive night of racing on Saturday 15 December headlined by the Madison, Team Sprint and Team Pursuit Nationals.